Travel north or south on the M5 at this time of year and it seems that every other vehicle has a sit-on-top kayak strapped to the roof. I sometimes wonder why anyone would want to buy one these odd-looking craft. Looking at the majority of hull-shapes, most of them don't seem to have much going for them as far as any worthwhile performance goes. Watching the attempts at paddling by some of those holidaymakers who do take them off their roof racks and actually get them wet, I'm even more convinced that the majority of sit-on-tops are on an evolutionary par with a common house-brick, in nautical terms. As a paddler of over 45 years year's experience and with a good bit of that time spent playing in the surf, it's all too easy to make fun of something, which for most users, will provide little more than a passing interest. The upside, of course, is that a certain percentage of those who break their paddling teeth on their odd-shaped first toys will progress to more serious paddling, and that has to be A Good Thing. 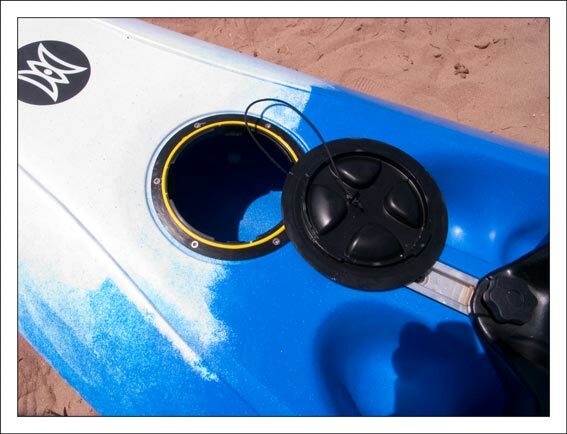 The other side of the coin is that those of us who are used to more user-specific kayaks might find a use for something with a little less performance for when the conditions favour a less committing time in the surf. I think Perception have secured a useful niche for themselves with the Five-0 and I'm astonished that very few quality kayak manufacturers have taken up the challenge to produce their own surf-specific kayaks. Apart from offerings by Perception, Necky, Dragorossi, Riot, Valley and Mega, there seems to be a gaping void in the surf kayak market. I don't believe there is insufficient interest for most manufacturers to take notice, I just don't think they are interested. Maybe they should take a collective trip to Saunton, Croyde or Woolacombe the next weekend a wave is forecast. After all, the Perception Five-0 has been around for a few years now and must still sell well enough to be viable! Not everyone wants a decked kayak and my time with the Five-0 puts it well and truly in comparable performance to the plastic Valley Storm that I once briefly owned and got rid of. I got rid of the Storm, not because I wasn't happy with the performance, but purely because of the lack of comfort and poor attention to detail in the manufacture (there is no excuse for razor sharp edges where the fittings have been trimmed out and not finished properly - razor sharp edges as in the cockpit rim and seat mouldings are capable of severe lacerations to hands and other exposed flesh). My usual surf machine is a composite Mega X-Ray. Anyone who has paddled any of Malcolm Pearcey's carbon kevlar-hulled High Performance creations in good surf will know all about the exhilaration to be had from throwing the little buggers around. I have had several Megas over a quite few years and all are an unbeatable blast, assuming you're in one that fits, even if only slightly! The Perception Five-0 scores well on numerous points and some of the compromises, especially in the choice of polyethylene as the construction material can be variously forgiven, overlooked (to a degree) or occasionally applauded. It's a kayak that has been well thought out for it's intended use. It even looks just about right as a surf craft. There is a very useful hatch for storing stuff like car keys, loose change, Mars bars etc. It comes with a mesh bag that fits in a rebate below the hatch lid which is opened or closed with a half-turn. The cover proved to be watertight and is fitted with a retaining cord, but be warned: the boat is completely hollow and if anything falls out of the mesh bag, it will disappear into the inside of the hull. With all of the moulded-in heel wells, seat and other fittings, there is a good chance that something vital, such as car keys or mobile phone could become wedged inside the hull. Play safe and put things in a drybag and clip it to the cover retaining cord. That way, things won't become lost! The hatch cover is very strong and is well up to the job. The adjustable footrest is a very substantial piece of kit and very well designed. Find a heel-well that is comfortable and adjust the footrest in the track with the two large stainless bolts and brass locking plates. It's a well made and simple solution with little to go wrong. The neoprene and webbing thigh straps are secured by brass clips through stainless 'd' rings fixed to the hull. I found the best way to adjust them is to loosen the ladder-lock buckles completely, sit in the normal paddling position and adjust both front and rear ladder-locks to find the best adjustment and then loosen the front ladder-locks. Before paddling out, you only have to pull on the front webbing to return the straps to a comfortable adjustment. 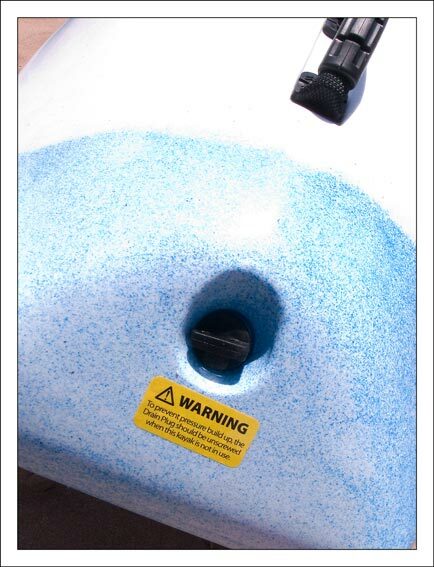 There is a threaded rubber bung in the stern which should be left open to relieve pressure when the boat is not being used. Be warned. It's there for a reason and it is necessary! The temperatures I experienced during the review went as high as 28C. 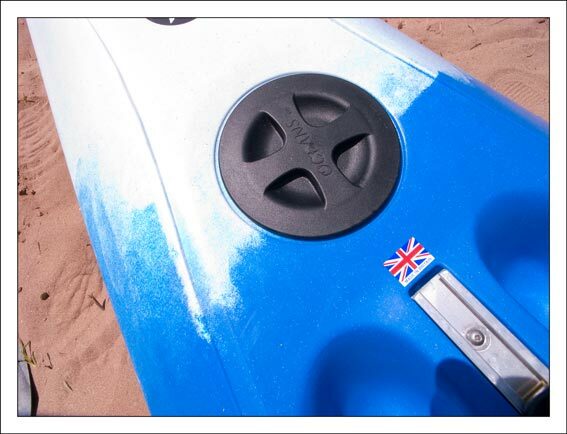 When I came off the water at low tide at Bantham I carried the kayak up the beach as far as the dunes where I released the bung and there was a very audible hiss as hot air escaped from inside the hull. I wouldn't want to leave the bung closed, but don't forget to tighten it before paddling out as the hull will fill with water! The Perception Five-0 is very wave-ski like in shape, although it seems long in comparison at 297cm. The nose has pronounced rocker, moving to the lowish volume mid section, but with enough volume throughout to float my 14.5 stones (203lbs/93kgs). The rails are very good and are surprisingly sharp for a polyethylene boat. The main bouyancy is where you would expect: around and behind the seat moulding. There is a non-slip texture (sand) applied to the seat moulding, but I think it might benefit from a thin layer of minicell sheet for some paddlers. I paddled in neoprene shorts which aided grip, but fabric-faced paddling trousers or a drysuit might not be so good for sticking your bum to the seat. There are two self-draining holes in the seat that go right through the hull. The stern is a sort of squash tail that does it's job. Those rails and the stern shape hold the faces well. The complete outfitting consists of grab handles, thigh straps, footrest assembly, hatch and mesh bag, skeg, pressure relief bung and, thoughtfully, a recess holding a plastic drinks bottle which is held in place by shockcord. That's a nice touch, surfing or rock-hopping can be thirsty work. Underneath, we have a finbox! If you are buying new, you'll find the skeg stored in the front hatch in the previously mentioned mesh bag and you will need to fit it with the two supplied stainless screws. 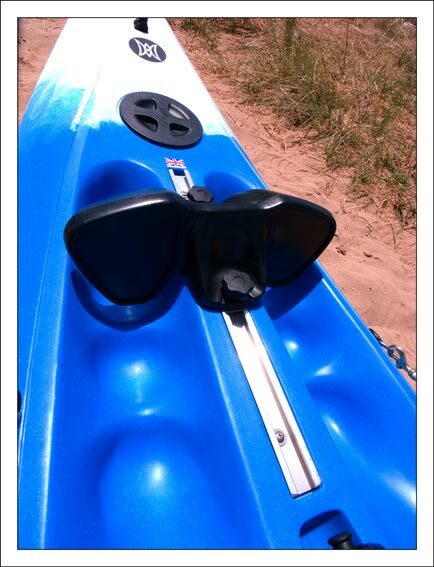 The skeg is not adjustable and is placed just behind the paddling position. 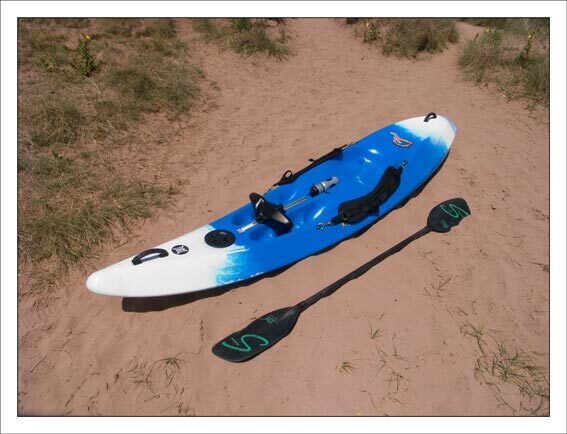 I did not paddle the Five-0 without the skeg, so can't really compare it's performance with and without a skeg. 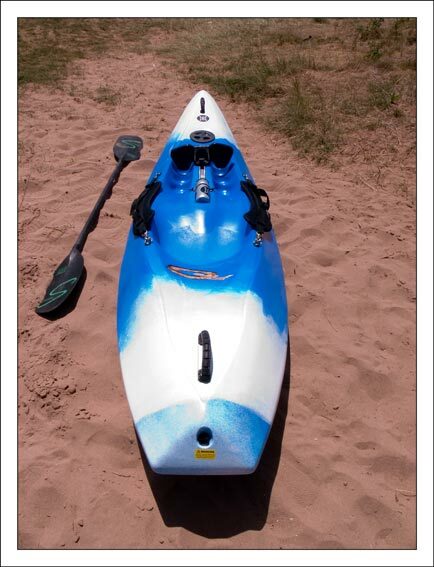 What I can say is that the kayak does not slide around when planing with the skeg attached, so I would always use it! The kayak is stable enough to climb aboard in water deep enough to paddle out from without a knuckle-dragging beach start that you often have to perform with a shorter, less stable boat. ......And surf it does! The Perception Five-0 does what it is designed to do and does it remarkably well. In 3+' clean surf, it was a fun time. If you are used to an hp boat, you'll have to modify your take-off. No dropping straight down the face because the nose will bury, despite the rocker. Presumably due in no small part to the hefty 20kgs weight of the fully-fitted boat. I pushed the boat as much as I could straight down a peaking wave face and got up-ended and face-planted for my trouble, it's not an easy boat to roll but what's the point of wasting effort in trying to roll if all you need to do is just climb back on and paddle away? Take off on a diagonal flight path down the face and the Five-0 is quick to plane and responds well to the rudder, bottom turns are easy and the boat will climb back up the face easily for such a large, heavy craft. You won't be doing any kick-flips but you are guaranteed all day fun in stable comfort. This is where the Perception Five-0 really scores: it is a very stable kayak and on slow days when the sets are well spaced, you won't become cramped and wobbly whilst waiting out the back as you would in a mean machine. The only real downside of the Five-0 is it's weight, at 20kgs it is one heavy Mother, especially on the carry back up the beach. That said, a thigh strap soon becomes a shoulder strap to spread the load. Tip: it carries best on the shoulder when the seat is toward your body. The fittings and finish are as good as you would expect from Perception, it is a quality outfitting without question and being predominately HDPE, aluminium, brass, stainless steel and acrylic, it is durable. 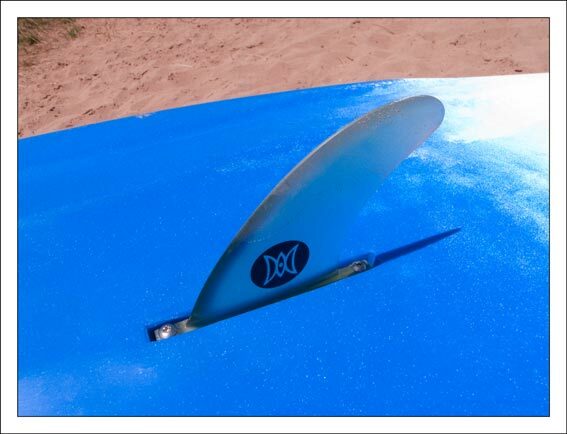 The main hull material makes itself known on the paddle out through the break: it feels a little sluggish, then as you power up and over an incoming crest, you and the boat will come crashing down hard on the other side. You will also feel the hull flex as you land, which can be annoying when you are used to something much stiffer, such as carbon kevlar. Anyone within ten metres of touchdown will either wince or look around for an inbound cross-channel ferry. It has just about enough forward speed to pick up green waves before the boardies can join you in the fun, and the bonus is that if one of those poor misguided souls does drop in on you, the subsequent collision will leave the Five-0 unmarked. 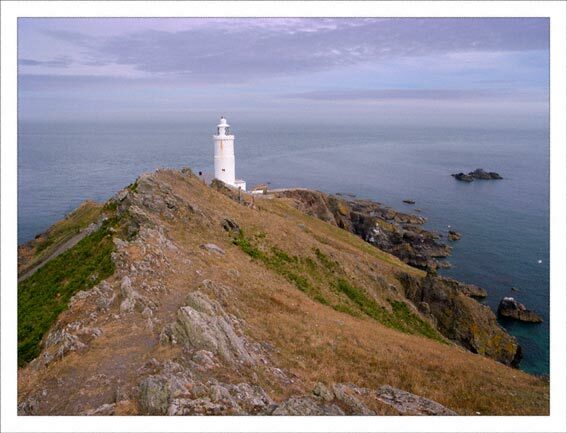 I make that point reluctantly, at Bantham I was the only goat boater paddling amongst a sea of fools. I dislike ignorant kayak surfers as much as anyone and I always try to be an ambassador for kayak surfing (after all, it was tough northern Eskimos who invented surfing - not soft southern Polynesians ;-).......) by being polite, chatty, adhering to the 'rules' and not generally behaving like a crabby 56 year-old in the face of tanned, blond youth. Unfortunately, most of the tanned, blond youths who were trying to outsurf me on their too-short short boards did not respond in kind and I spent much of my time steering the Perception Five-0 around them and out of trouble.....or running rings around them, depending on your point of view. This again says much about the agility of the Five-0 under power - it carves, turns, climbs and drops very well and quickly responds to shifts of body position and paddle pressure. If you want to learn how to kayak surf without the need for a bombproof roll or if you just want all-day fun in comfort without the wobbles and dead lower limbs and abs that an hp torture device will give you - get a Perception Five-0 now. 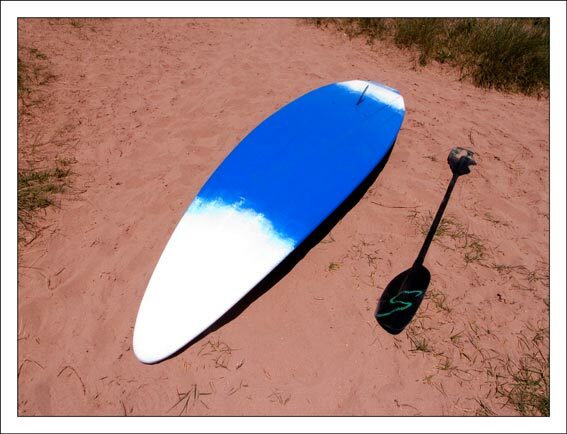 You won't regret buying one, it's fun and if the surf dies you can always go rock-hopping. For: Performance, outfitting, price (£499 but could be had cheaper with a bit of arm-twisting), shape. Just come across your site as I'm new to the blog world. I've owned a Perception 5-0 for a few years now - really liked the review as it catches the benefits and disadvantages perfectly. In never cracked rolling so the sit-on works well for me although the specialist decked kayaks look much better for tricks and stunts so I'm considering trying to learn again and have the best of both worlds. Thanks, Andy. The 5-0 is a good choice and offers a lot of fun if you don't have the ability to roll yet. In terms of performance, it doesn't compare to a HP surf kayak, but then there are none of the disadvantages either. i just got a five o, been using a fat yak for a year,needed to progress and read your review. still on the basics, like staying upright but getting there, any advise on taking off diagnally would be good as i end up in the bongo slide,albeit fun id like to choose when. i am no expert but fear of breaking the fin makes me take it off when the shore dumps about, i didnt put it on for a few goes and found i could keep it straight but not much else. A great review on the Five 0. I am about to sell a Perception Scooter and replace with either a Five or a Waveski of some description. I mirror your comments about the abundance of sit - on kayaks seen on roof racks and yes the number used on anything more than a slight ripple is possibly single figures. But I think most are purchased by fishermen who have seen the benefits of getting on the water instead of pulling muscles casting from the beach. Mine are only launched when there is good surf. Sadly that generally means a long drive from Sussex to Devon/Cornwall (Tracey will agree probably). Unless you want to try rough seas - and yes I have. The only problem with places such as Shoreham is the slope of the beach. It causes waves to dump energy all at once and makes the return to shore an interesting trip! It also annoys the surfers and they seem to hate kayakers with a passion ( some won't even acknowledge you in or out of water). But I am thick skinned yet polite. Cornish surfers are more accepting of kayakers who are serious about their surfing and as yet, each trip has been a pleasure with good advice proffered when visiting a beach for the first time. It could be the entertainment factor I provide to them that makes the whole experience friendly! I have however had some great fun in good surf (Polzeath, Chapelporth, Widemouth, Bude etc) over the past two years. The responsiveness to the paddle when riding a wave is slow at times and you really do need to have sound physical fitness to use a Scooter effectively and safely in such conditions. You mentioned take off on the Five 0 and planting the nose. Only when I was first trying out the Scooter did that happen (ok still does when not concentrating fully!. It might be due to my weight (95kg) that when I shift forward or back, the boat responds well - but the speed is lost when you travel along the wave. The reason for the change in boat is performance. My concern is the size of the Five 0. It is on a par with the Scooter and I do want to do more on the waves I catch. Guys such as Mr Dazp1 have provided amazing footage on Youtube and have been instrumental in me including the Five 0 in my choices. Compare my poor efforts with his and the difference in boat performance is obvious. Skill also has a part to play :-)! Once a buyer secured for the Scooter I will be off to Devon/Cornwall to try before I buy and then decide which is best for me. But your review has certainly paved the way for the bets to be on the Five 0.